If you are looking for a van or other vehicle to fit your unique needs, DW Auto and Home Mobility has a wide variety of new wheelchair accessible vans, used wheelchair accessible vans, new and pre-owned wheelchair accessible trucks, conversion vans, cars and SUV’s in-stock. We can custom fit a van, truck or SUV to meet your needs and your budget. If you would like an at home personal demonstration simply contact our courteous staff at 1-800-568-2271 and we will gladly bring the vehicle of your choice right to your doorstep. 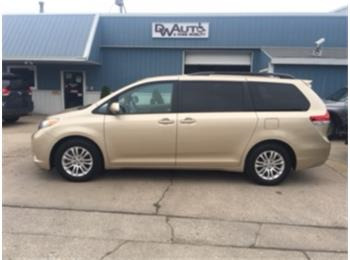 This is a 2013 Toyota Sienna XLT with 25,116 miles. This car features beautiful interior features and a brand new wheel chair accessible conversion!